What on earth is wrong with calling it Bravo? HTC has taken Android top-end by introducing a new high-power device: the HTC Desire. Taking more than a few cues from the Google Nexus One (which was designed by HTC) the Taiwanese company has added a few embellishments to the Desire (formerly codenamed the Bravo). While the chassis remains the same size, the HTC Desire has added some physical buttons at the bottom (which are welcome after our review showed some issues with the touch-sensitivity on the Nexus One). The trackball has also been replaced by an optical version - but the main addition is the Sense UI Android overlay. Android 2.1 might have been used on the Nexus One, but the Sense overlay turbocharges it, with the same Friendsteam social networking integration tool used on the Legend present on the HTC Desire too. Living wallpapers (and Google Navigation for our US cousins) are all present and correct, and multi-touch capability is also enabled. This has led HTC to create something really neat - Helicopter Mode, which allows you to simply pinch in on the home screen and see all seven of your widget-filled windows at once; a real time saving boon. 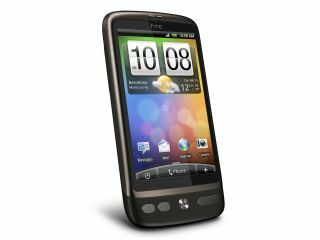 Like the Nexus One, the HTC Desire uses a 1GHz Snapdragon processor and packs a 3.7-inch OLED screen - although there's no dock connector or active noise cancellation on the Desire. However, HTC has said that doing this allows it to keep the cost down - while there's been no work on UK pricing yet, we expect this to come in SIM free at less than £480, which is a pretty smart price point. A UK release date of late March/early April has been strongly tipped for the HTC Desire, and it looks like Orange will be one of the first networks to pick it up.